What can we learn about Birmingham and its urban core after comparing it to Mobile’s, the third-largest city in the state (but second biggest metro, at about half the size of our 1.2 million)? 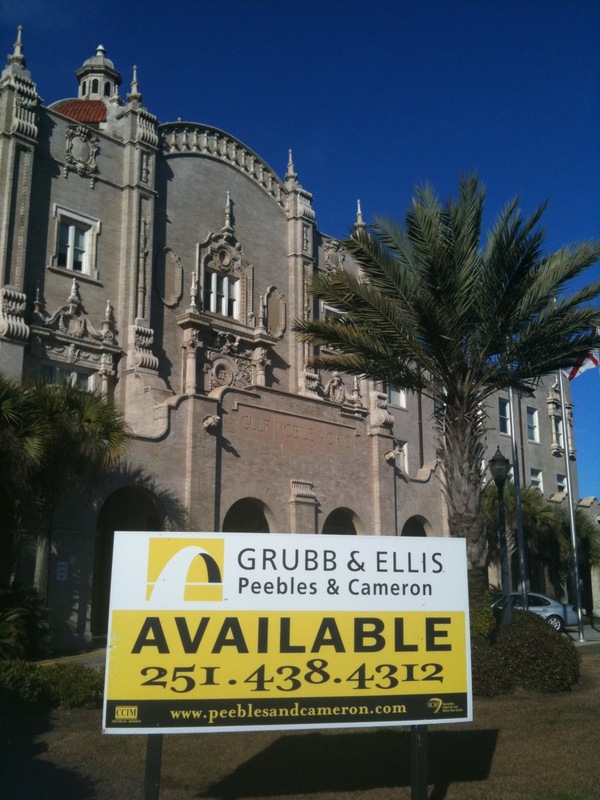 On a recent trip I was able to get a quick glimpse of downtown Mobile, and observe some interesting things. First, wayfinding. Central Birmingham has basically none–and we need it. Bad. For anyone visiting (whether from afar or just the ‘burbs), graphically clear signage which helps you navigate a city is essential. 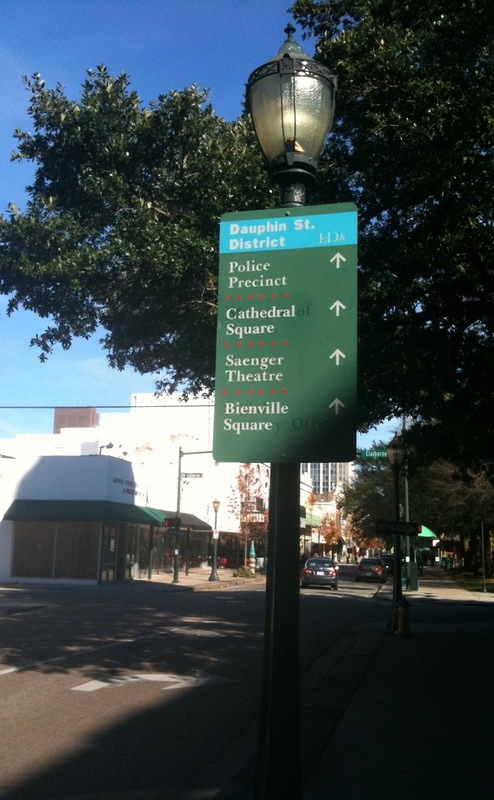 The above is an example of signage found throughout downtown Mobile–simple, to the point, and informative. Second, good urban signage. Birmingham–thanks in part to enlightened members of the Design Review Committee, is more likely today to approve well-designed, projecting and/or illuminated signage for businesses in our urban areas. But the process can still feel like a struggle (one sign we designed for a project downtown took over 3 months to work its way through the City Legal Department after DRC approval). To the left you see some excellent signage at the hip Dauphin Street Taqueria ; in downtown Mobile, the city has a financial incentive to encourage owners to upgrade signage and illuminate it. Fantastic incentive, and the nice projecting signs across the core are a testimony to its success. Third, Mobile’s older street grid means narrower dimensions–so instead of our wide avenues with 5 or 6 traffic, turn, and parking lanes–you get 4, or 3 total lanes which makes for a more pedestrian friendly environment (quicker to cross, and less traffic on the streets). Below is a shot looking towards the Battle House Hotel, Mobile’s smaller version of our old Tutwiler Hotel, demolished in the 1970s for the First Alabama Bank Building. In Mobile–where development pressure downtown was so slight, it makes Birmingham look like an Atlanta–the hotel was just quietly boarded up and remained vacant until the Retirement Systems of Alabama incorporated it into its huge RSA Tower complex completed a few years ago. Because of the RSA’s muscle, downtown Mobile now has 2 4-star Renaissance hotel properties–while Birmingham has no 4 -star properties anywhere close to downtown (though a Westin is planned to break ground shortly). Yes, we’re thrilled the News built a new facility downtown. It’s just a shame that instead of visualizing a new use for an outdated building like they did in Mobile, they tore it down for a few parking spaces instead. A very, very 1969 solution to a problem. Which brings us to the train station. In 1969 we tore ours down. Mobile’s still stands, although mostly vacant (they lost their passenger service long ago), and at a disadvantaged location down Water Street (it was a hardy 20-minute walk down a warehouse and gas-station-laden 6-lane highway from the Battle House). If Water Street could be re-envisioned as a pedestrian-friendly boulevard, with mixed-use and a waterfront promenade–then the old station could be a wonderful terminus again. Mobile’s core is much smaller than Birmingham’s by any measure–fewer office workers, fewer residents, fewer buildings–and the scale is very different. It feels more like a small city than, well, a medium-sized one. 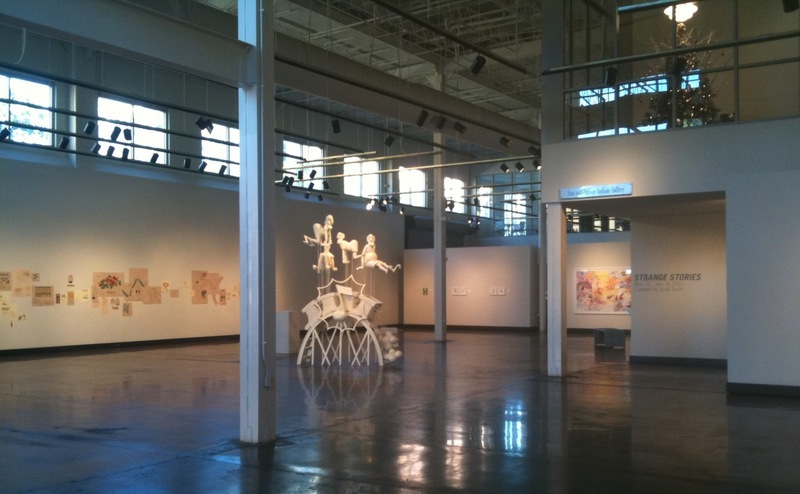 This smaller scale is one factor that can make redevelopment easier. Lower Dauphin Street is lined with bars and restaurants and even some retail shops–but all the buildings are mainly one or two stories. Big, complicated, and expensive redevelopments are not necessary on this scale. However, some basics of adaptive reuse, signage, even public postings of imminent Design Review hearings are all instructive as we work to create a better Birmingham. It’s clear that Mobile has made some real efforts to reinvigorate their center. And, the City is considering adopting SmartCode for their downtown, similar to Montgomery, to help propel development in the right direction. This is something we’d love to see here too. 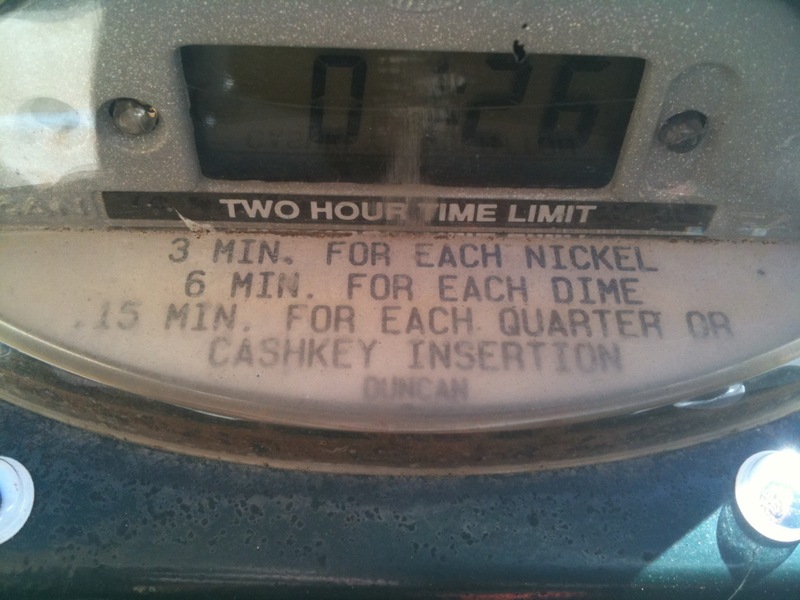 On a last note, I couldn’t help notice that city parking meters downtown allow 15 minutes per quarter–rather than the 60 minutes per quarter in Birmingham. And we have a much, much more congested downtown than Mobile. I believe Birmingham ranks as one of the largest cities with the cheapest on-street parking. This puts more cars on the street, circling for those cheap spaces–rather than considering decks, or walking, or transit. We’ve got to get used to paying more at the meter here. Next post–Austin, TX! Happy New Year everybody. Here’s to a great 2011 in the ‘ham. This entry was posted in Uncategorized and tagged Alabama, Battle House Hotel, Birmingham News, Center for the Living Arts, Dauphin Street, Design Review Committee, Mobile, Mobile Press Register, RSA, Tutwiler Hotel, Water Street, wayfinding. Bookmark the permalink. It seems to me that both Montgomery and Mobile used all the years that Birmingham’s City Council, Jefferson County’s Commission, and the Jefferson County legislative delegation spent arguing to position themselves for both growth and renewal. Birmingham has such great potential, yet it lags behind in so many areas. I follow a number of blogs where both the bloggers and those who comment have such great ideas. Is there anyone in city government or a group monitoring them and actually working to turn them into reality? James–great question. I know that locally some of our City committees/planners do read the blogs and this has lead to some discussions about changing things. Wish it were more comprehensive though. Good report. The difference in street width and pedestrian comfort is telling. All the more reason for the City of Birmingham to get serious about converting many currently one-way streets to two-way as recommended in the UDA master plan. Combined with other traffic-calming moves, that would tip the city center toward a proper pedestrian/vehicular balance. 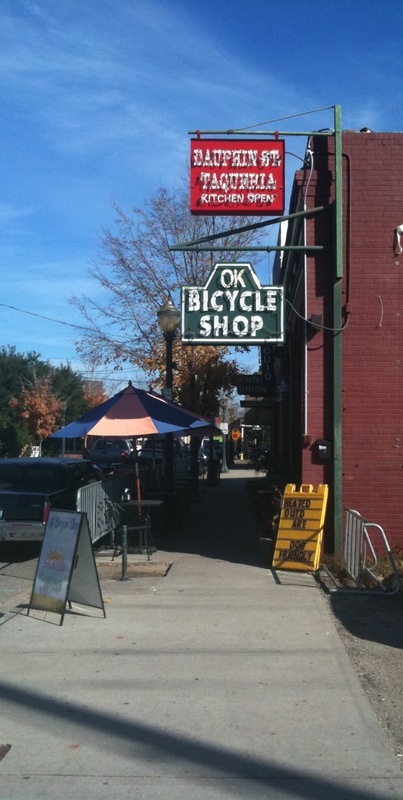 Yes–downtown Austin has a plan to change many one-ways to two-way, and is ripping up streets to install wider sidewalks, more bike lanes, some angled parking, etc. We need to do this here too! In spite of Birmingham being user indifferent, you couldn’t pay me to live in Mobile. Evidently, most people who have moved to Alabama since 2000 agree that Central Alabama is the place to be. Still, this is something IBIB can address: How to make Birmingham user friendly, welcoming and hospitable. I’ll take these three things over job growth and new construction any day. Haha–well, Mobile did not necessarily feel like the place I’d want to move to, either. I will say this for job growth/new construction after my recent trip to Austin–the growth feeds tax revenue which in turn funds light rail, better bus systems, more user-friendly streets and sidewalks; and new construction can inspire pride. I think you need a combination of all these elements. Maybe we should ask the “You Are Beautiful” guerilla signage team to append some directional indicators. Yes! Actually a great idea to have a gritty, artistic theme rather than a more corporate, conventional one. Like it. Birmingham’s grid, often times, strikes me as a gift and a curse. Wide avenues allow of excellent traffic flow — especially when compared to other cities, peer and larger ones. However, that same gift often creates an atmosphere that is terribly unfriendly to pedestrians. Perhaps a nice balance is possible; one that would call for the reclamation of some wider streets (e.g. 18th Street) and the elimination of on-street parking and/or turn lanes. With the newly freed space, extend the sidewalks and create a few streets that truly cater to pedestrians. Hey, a guy can dream, can’t he? Yes, yes, yes! All possible, and a guy can definitely dream. The grid isn’t necessarily the problem. While I’ve never been to Mobile, I’ve had the pleasure of meeting the person who headed their old Main Street program (she was friends with my old boss in Savannah) and it has been compared several times with Savannah, where I did live for 11 years. The fact that we still have wide one-way streets in greater downtown is one reason. It’s also weird to look at how far folks are willing to walk in Savannah compared to here in Birmingham. When I lived downtown I’d get weird looks from neighbors for just walking three or four blocks to go somewhere to eat or to meet with people. The distances aren’t bad – it’s the perception that because nothing is on the street that no one should be walking it. 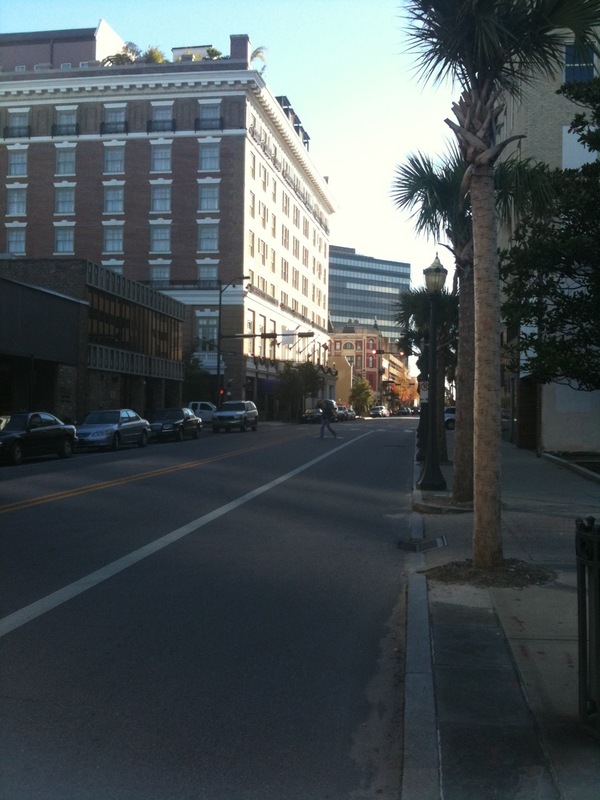 We were able to get people to move into downtown Savannah because people were willing to say that they’d walk and then they actually did just that to those early urban outposts that were downtown. Those things that we don’t have in the area called downtown (or Birmingham’s central business district) could also go into Southside (or greater downtown) just “across the tracks” with no problem. Things like Railroad Park and the development that it’s encouraging should hopefully get some of the mental barriers that we’ve created knocked down so that folks enjoy the full potential. One thing I’ll ask folks to keep in mind. I moved to Savannah in 1992 and left in 2004; most of the things that my office was most proud of seeing accomplished still didn’t get completed until 2008 (and they were set in motion around 2000). It did not get this way overnight in Birmingham (or anywhere else going through these issues right now). It will take people being willing to push forward for several years to see tangible successes. Your last point about patience and planning is well-put. To add to that–we have some pretty good plans in this City, from City Center Master Plan, to numerous transit and bike trail plans–but very little patient follow-through and commitment. Savannah, Austin, Chattanooga–these cities all rallied around plans and also committed to the long-haul of implementation. That’s the piece we’re missing.